Another dish that’s super yummy on Thanksgiving, or any other day this time of year. Sweet, salty, tangy, dare I say gooey? My dad found this recipe in Thanksgiving Dinner: Recipes, Techniques, and Tips for America’s Favorite Celebration. It came out really tasty the other day when I made it, except I just can never get down with boiled brussels sprouts. Come on, isn’t that why we all hated them as kids? I didn’t even cook them for the suggested 5 minutes, and still couldn’t handle the mushiness. And I’m not a picky eater. But hey, this book is from 1990 and you can buy it for one cent on Amazon. Pretty good deal if you ask me, boiling sprouts sin aside. 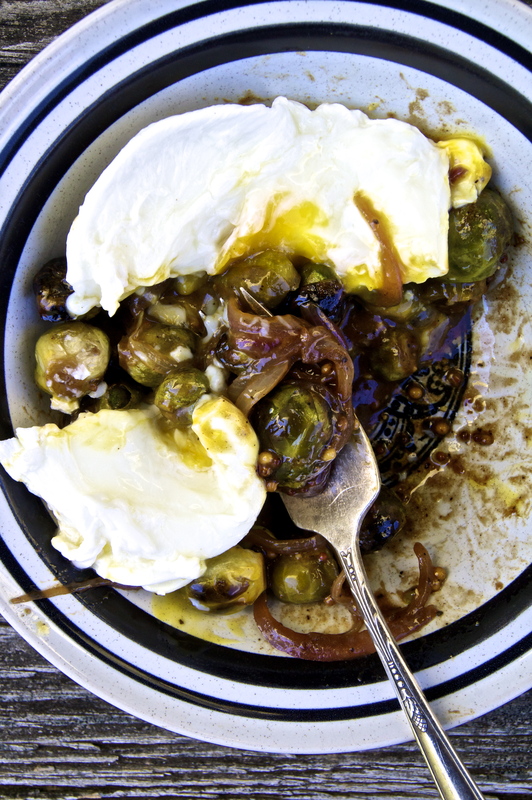 Back to the cast iron pan for you, brussels sprouts. That’s where you belong, and that’s where I love you. That just crisped exterior, sweet inside, with a little bite remaining. This is my take on the recipe, and one that I know I’ll keep going back to this winter. One of the lovely things about this recipe is it can be served either hot or at room temp. Yes! Another room temp friendly side for Thanksgiving. Praise whatever it is that you praise. First thing you’ll want to do is make your vinaigrette. Mix the vinegars, maple syrup, Dijon mustard, only 1 tablespoon of the grainy mustard, salt, pepper, and nutmeg. Reserve the remaining tablespoon of grainy mustard until the end. If you’re feeling really ambitious, you can make your own grainy mustard a couple days prior. It’s actually really easy but apparently sounds impressive. Or just go with what you have. Whisk everything thoroughly, then slowly add the olive oil, only a drop or two at a time to get the liquids used to each other. Then add the oil in a slow, steady stream, whisking constantly to emulsify. It will become thicker and lighter in color. Set aside. Turn on your broiler – real hot, real hot. 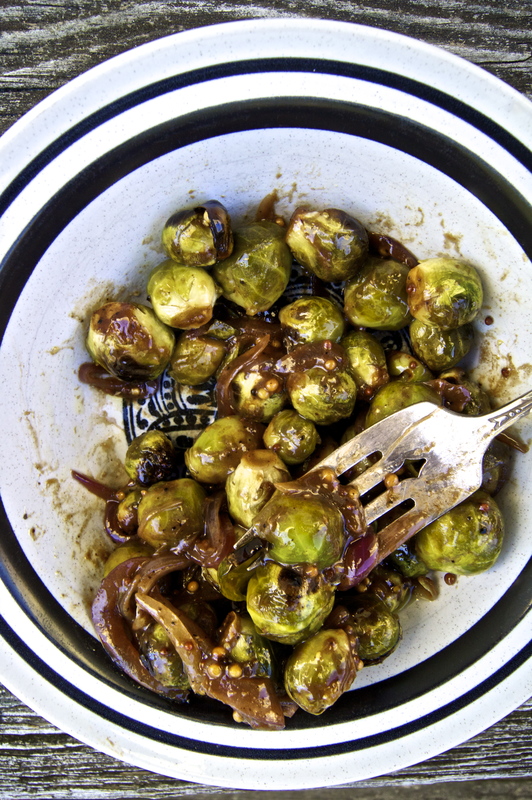 Preheat your cast iron pan in the broiler, and turn your attention to cleaning the sprouts. I think the easiest way to trim brussels sprouts is to use a paring knife and just slice a teeny bit off the bottom. As that falls away, so will most of the beat up exterior leaves. 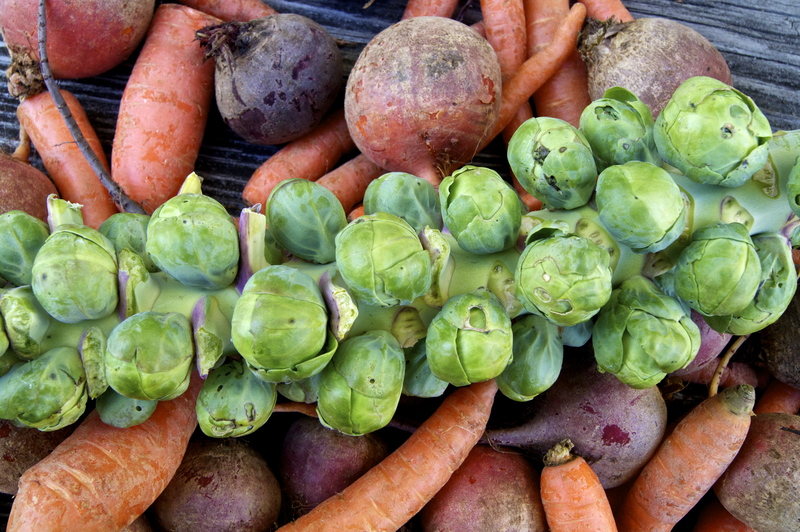 You may need to trim a bit more depending on what shape your sprouts are in, but I think this is the fastest way. Wash them in a big bowl of water, swishing around. 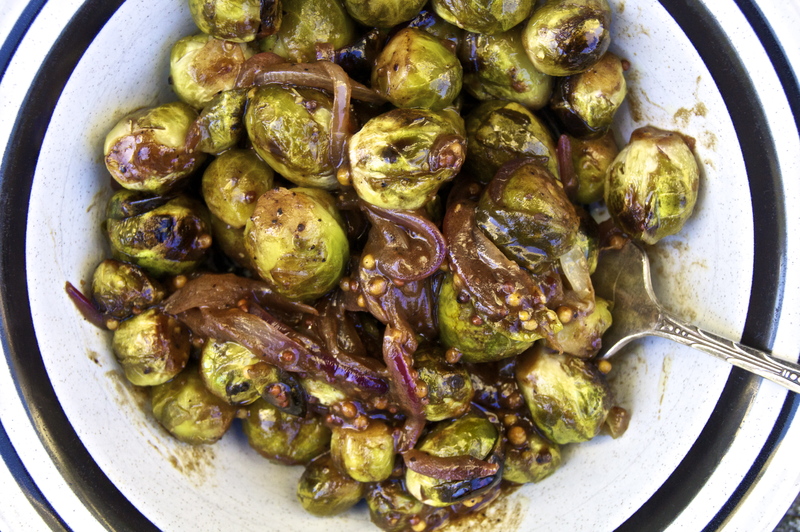 Brussels sprouts can be like leeks, in the sense that it can be hard to tell if they’re totally clean. So, lots of water swoosh swooshing is a good thing. Drain well and dry with a kitchen towel. You don’t want too much water left on them since they’ll be going into a very hot pan. If you have a second cast iron pan, preheat it on the stove over medium heat. Thinly slice the onion. Once the pan is hot enough (water will sizzle quickly on contact), add a knob of butter, let it melt, and add in the onion and a couple pinches of salt. The onions will need about a half hour or so to caramelize. If they get dried out, add maybe a touch more salt since it draws the moisture out, but only do this once or twice. You can add a little bit of water and that helps out a lot. Let the onions continue cooking while switching back to the brussels sprouts. By now, the cast iron pan should be nice and hot. Take it out of the broiler, add in a knob of butter and let it melt, then add in the brussels sprouts. Stir them around, let them calm down, then pour just a bit of the vinaigrette on top, mixing well. It’ll sputter and spit. Mix mix, then back into the broiler. They’ll only need a few minutes since it’s so hot in there – I’d say 5-7 minutes. Take them out and stir every few minutes to make sure they’re getting evenly charred, and not too cooked in any one spot. Remove from heat and put the sprouts into a bowl. The onions may be close to ready now. When they’re just about done – nice and lightly brown and sweet tasting, add in a drizzle of balsamic vinegar, and let cook for another minute or so. Remove from heat and add the onions to the bowl with the sprouts. Pour about half of the vinaigrette into the bowl, mixing well, and add more until it seems everything is well covered. Add in the remaining tablespoon of grainy mustard – this really balances it out. This dish can be served at room temp or hot, and may be made the day before. If making the day before, you can do everything but add the sauce at the end. Call me crazy, but this also makes a really tasty breakfast with a poached egg on top. Super gooey once that yolk gets involved. Diane! This makes me so happy that you tried & loved them! !